Back in 2001, I studied in New Era University in Commonwealth but I never had the chance to visit Fairview or maybe I just can't remember it. The moment I set my foot on the grounds of SM City Fairview, there is a sudden gush of Deja Vu. But maybe let's just say I really feel at home whenever I go to any SM malls. Almost 2 hours of Bus ride from Mandaluyong, SM Fairview is obviously a mall erected only to satisfy this small community in Quezon City that is too far to other malls. Back in 1997, SM City Fairview is erected at the intersection of Quirino Avenue and Regalado Avenue in Quezon City. 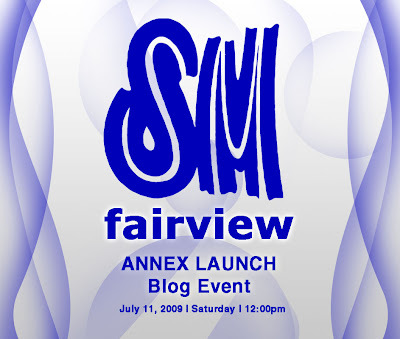 SM Fairview have been serving the community for almost 12 years now and with the continued growth of its Market that stretches up to neighboring towns and province, management decided to expand the mall to accommodate not only the customers and consumers but also merchants that can offer their goods and services. November 2008, Annex is officially opened to public. Annex will serve the upscale shopping, dining and entertainment requirements of SM City Fairview. A building that can contain 70 tenants which is approximately 11,748 square meters (28,611 square meters gross floor area) is a perfect place for shoppers and leisure hunters. The mall's selection of fast foods and fine dining is already enough to satisfy everybody's taste buds, from food chains to specialty restos, SM City Fairview has a wide array of dining stops that will guarantee a gastronomical haven. And lastly on the Entertainment side, the events hall is large enough to accommodate a big event such as trade shows, concerts and mall tours. The SM Cinemas though are still untouched and management promised us that soon the cinemas will be renovated to upgrade facilities that will fit the patrons, desire in cinematic experience. But if you are not in the mood to watch a flick, just go to Story Land to experience a moment of childhood with amusement rides, kiddie shows and mascots. I can't promise that I will be visiting SM City Fairview that often because logically speaking it is too far from home. But I guarantee that SM City Fairview is a gift to all the people of this small town in Quezon City. It has all the things they all need and they don't need to travel to far neighboring cities and town just to shop. And now with SM City Fairview's new Annex building, they will be experiencing a new level in shopping experience.